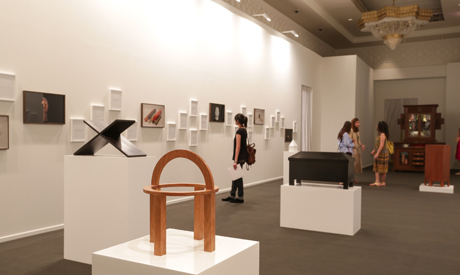 The Abraaj Group Art Prize 2013 was awarded to proposals of installations by five emerging artists from the Middle East: Iman Issa from Egypt; Hrair Sarkissian from Syria; Vartan Avakian and Rayyane Tabet from Lebanon, and Huma Mulji from Pakistan. The artists have been working with guest curator Murtaza Vali for the past six months to realise and fine-tune their projects, which were unveiled as per tradition at Art Dubai in an exhibition entitled extra / ordinary held from 19 to 23 March. Funded by leading private equity investor, the Abraaj Group, the Art Prize seeks to support and showcase exceptional talent emerging in the Middle East, North Africa and South Asia. Underlining the annual art grant is a pursuit for projects that transcends geographic borders, while being entrenched in the region from which they emerge. 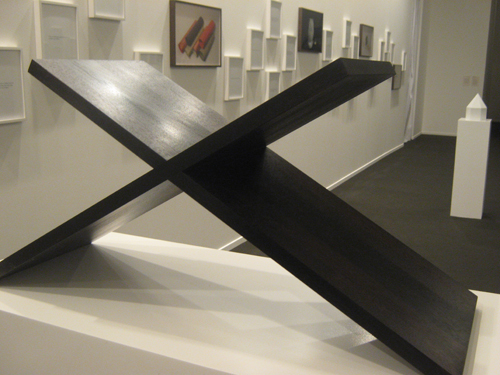 Another curatorial commitment on the part of Abraaj is to toy around with the boundaries of mediums. The result? Five installations that carry political undertones within the context of broader social critique. Guest curator Murtaza Vali explains that the idea behind this year’s exhibition, extra / ordinary was "not to produce larger than life artwork, but rather to refocus attention on the banal routine of daily life." Vali elaborates that the five winning projects reflect insidious political undertones, while echoing conversations of mundane contemporary life. In an installation entitled Common Elements, contemporary visual artist Iman Issa (who happens to be the third Egyptian to win the Abraaj Group Art Prize after Wael Shawky and Hala Elkoussy in 2012 and 2011, respectively) juxtaposes 54 text panels bearing quotes from four distinguished Arab writers from the Middle East; professor of English Literature, proponent of Palestinian rights and author of iconic book Orientalist Edward Said, Palestinian poet and writer Mourid Barghouti, legendary Egyptian novelist and intellectual Taha Hussein and Egyptian feminist and writer Nawal Al-Saadawi, with five wooden sculptures and 14 coloured photographs. After reading a large number of autobiographies in preparation for this project, Issa chose these five texts by four Arab figures, who had all incidentally spent time in her hometown, Cairo. The artist went line by line through the five books she chose, hunting for excerpts that carry language that transcends the storyline of the individual and provides hints of a broader socio-political context. "I found autobiography an interesting form, because [while writing] you have the humility of speaking only for yourself, but a lot of times you also give the implication that it’s something more," the artist told Ahram Online minutes before the official unveiling of the Abraaj prize winners. "So it is the story of this man or this woman, but it’s also the story of this country, this war, this region." Issa was hunting for words that transcend the story of an individual that could be read as snippets of the memoirs of an entire generation. "I extracted all the instances where I felt that this dynamic of the personal narrative becoming something more happened," she says. Autobiography also interested Issa as a vehicle for communicating memory; a fundamentally subjective material. "When you work with memory, you always ask yourself the question; okay, I’m working with memory, how is anyone else supposed to understand it? How can I communicate it?" And, indeed, it feels like a walk down memory lane as the audience makes their way down the narrow white-walled hall, with text panels arranged sporadically across both sides, intertwined with photographs of a wide array of objects that differ in texture in reality, yet are identical today, including wooden palms, rolls of brightly-coloured paper, an ornate ceramic plate, bamboo pots, among others, and wooden sculptures, including a large, jet-black X-shaped figurine, a coffin-like box and other objects. "In the future we will have a collective memory identical to the individual’s memory. It will be as if what happened to one, happened to all," one text panel reads. Another melancholic question is: "I am a writer, which means I don’t do anything. Isn’t that miserable?" And yet another sign poignantly states: "Departure is the state of being abandoned even though it is you who leaves." The images sprinkled among the minimalist text panels, depicting a range of objects including an empty notebook, a white owl and outstretched granite palms, among others, function here as illustration to this string of seemingly arbitrary, heartrending quotes. Issa says she was stuck for months trying to figure out how to visually represent her chosen texts. She explains that while walking around in a vast array of museums, "the spell broke" and she started to visualise objects and sculptures that seemed appropriate as visual aids. There is no direct relationship between the text and the images, but do not try to ask the artist for an explanation, she is as clueless as we are: "I don’t know why I chose these images," she says. And like us, she is really interested to find out. "I’m hoping the whole thing will be read together," she says. "The question is: what is the common element?" Issa explains that she always works with questions, and that answers are not as important. "That is why it takes me forever to make a project," she says with a chuckle. This project, for instance, took Issa two years to complete. Common Elements is not Issa’s own autobiography illustrated; her dynamic installation draws on the words of four iconic Arab writers to create a dialogue between the spectators, the memoirs, and herself. "I’m not interested in psychoanalysing myself, or just dumping my own emotions. I’m interested in communication, and communication always involves another person," she says. Through yanking out excerpts of texts, and in effect de-contextualising the autobiographies she worked with, Issa set out to create a single collective narrative of a life devoted to renaissance and resistance. Also working with nostalgia, Syrian artist Hrair Sarkissian exhibits a stunning project entitled Background, in which he exhibits six theatrical images documenting photography studios he visited in six cities; Alexandria, Amman, Beirut, Byblos, Cairo and Istanbul. 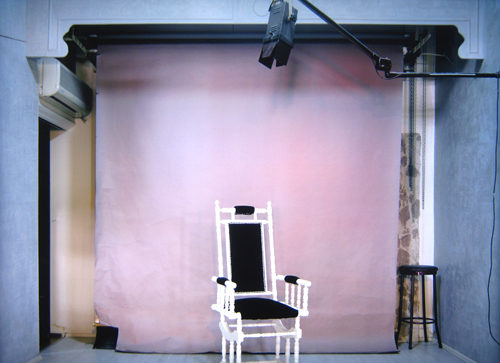 Paying tribute to the end of a studio portraiture era that has been eclipsed by the emergence of digital photography, Sarkissian exhibits these backdrops, some lavishly decorated with a large piano, others a minimalist tower of books or a faint pink sheet, without a sitter, and hung unframed like backdrops, backlit with neon bulbs. "To me, these images are, bright, yes, but they are also melancholic," says curator Vali. "They represent the disappearance of the tradition of studio photography." Similarly inviting audiences to refocus their attention on details and to read the fine print, Pakistani artist Huma Mulji exhibits The Miraculous Lives of This and That, a modern take on the Wunderkammer or Cabinet of Curiosities, a showcase of objects deemed "nasty" by Vali, such as rotting teeth, taxidermy animals, porcelain imitations of cheap plastic dolls, among others. The objects randomly organised in an oversized wooden cabinet are a collection of ordinary and extraordinary objects that the artist stumbled upon in the streets and bazaars of Lahore. 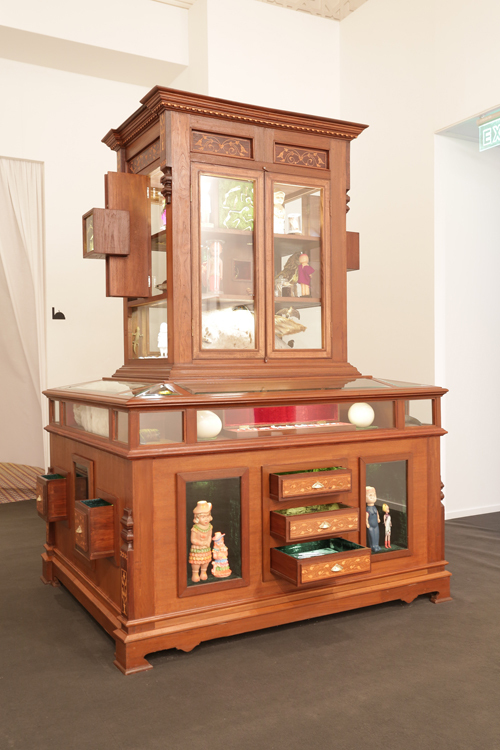 Coated with a later of dust, the cabinet entices (and perhaps at times disgusts) onlookers with objects that straddle the line between animate and inanimate, and the installation emerges as a slightly haunting storytelling device. "As a whole, the project is a meditation on the inevitability of death and decay, and what it means for objects to outlive their use," explains Vali. 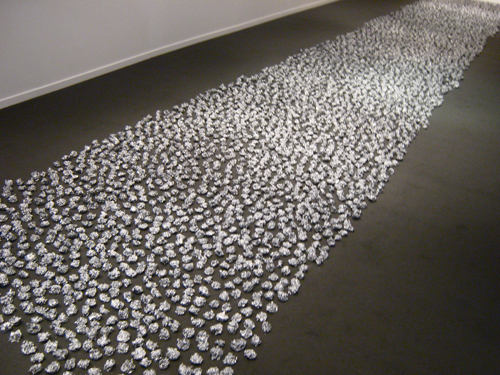 Another extremely interesting, mysterious work is a floor installation entitled FIRE / CAST / DRAW made up of 5000 bumpy blobs of melted lead, each individually hand cast by Lebanese artist Rayyane Tabet. The artist repeatedly poured the equivalent to a single bullet worth of melted lead into a water-filled coffee cup, in re-enactment of a ritual called "molybdomancy" that his grandmother performed on him in his youth. The face of the person who has cast the evil eye your way is thought to appear in the lump of melted lead. The installation, which features half a ton of lead, tackles folklore, superstition and magic, and perhaps, most of all, the violence that plagues the Middle East’s contemporary conflict-ridden past and present. 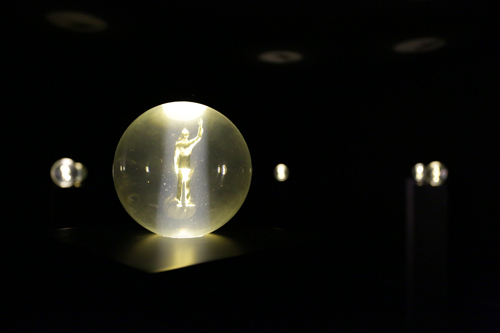 The final project, a very visually captivating installation of miniature gold statues transfixed in clear acrylic spheres entitled A Very Short History of Tall Men produced by another Lebanese artist, Vartan Avakian, commemorates forgotten leaders of failed coups d’états. Compared with the seemingly never-ending, slightly disorienting maze of exhibition booths in the main Art Dubai halls at Madinet Jumeirah, this well-curated Abraaj Group Art Prize exhibition provided adequate space for onlookers to take in and experience the individual installations.